Earlier this week, 35 organizations that provide support for students, families, veterans, taxpayers and service members voiced concern about the closures of Vatterott Education Holdings and Education Corporation of America (ECA) in a letter to the Secretary of the U.S. Department of Education. The ECA announced that nearly all of its schools will close its doors on Dec. 5. Vatterott Education Holdings made the same announcement on Dec. 17. 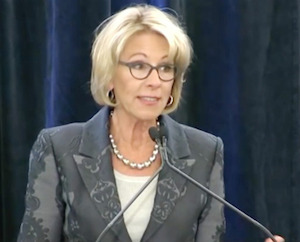 The organizations told Betsy DeVos that they are concerned that the Department of Education “has not provided clear and direct guidance to students” about pathways they should take after their school closes. “This is particularly concerning given the Department’s long awareness that both ECA and Vetterott were in serious jeopardy of losing accreditation and at risk of financial collapse,” the letter read. Hold the private equity owners and creditors financially liable for their abrupt closures to the fullest extent possible. “The Department has once again ignored multiple warning signs, and failed to require a letter of credit or take appropriate action to protect the more than 22,000 students and 4,000 GI Bill beneficiaries left holding largely useless credits and likely considerable debt from ECA and Vatterott Holdings owned schools,” the organizations wrote in the letter.